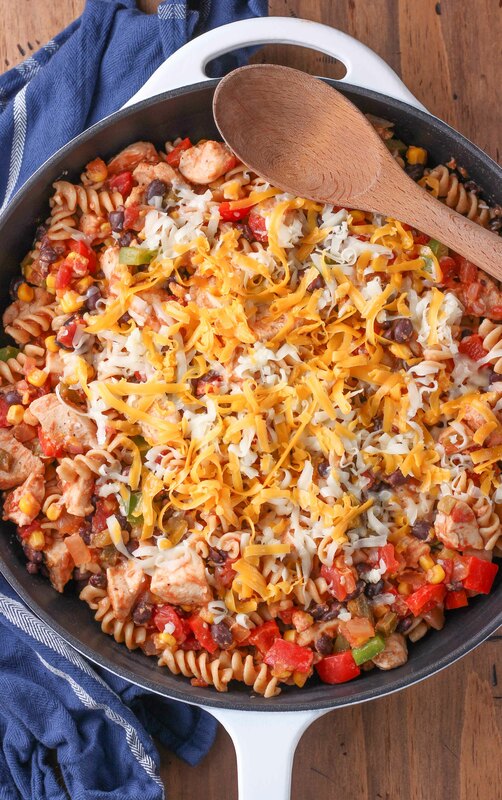 This Cheesy Salsa and Chicken Pasta Skillet is warm, hearty comfort food that’s ready in 30 minutes! Perfect for busy weeknights when you want to get your protein an veggies in without a lot of preparation! *Text and recipe from 07/18/12. Images updated 10/27/17. I think it’s pretty well established that weeknights can get crazy this time of year. Homework, sports, school meetings, the time you have after you get home from work is pretty much booked until bedtime. So, it’s important to have easy meals that you can turn to when you need something to feed the family that doesn’t take forever to get on the table! 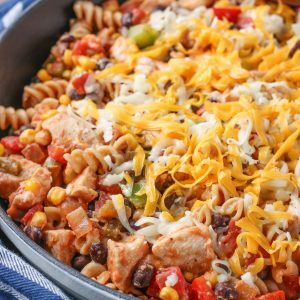 Enter skillet meals! One pan, a small amount of prep work, and a short cooking time. Skillet meals frequently make an appearance at our house because of how convenient they are. Easy and they usually use ingredients that I already have on hand in the pantry and freezer. Plus, they are usually hearty and filling. 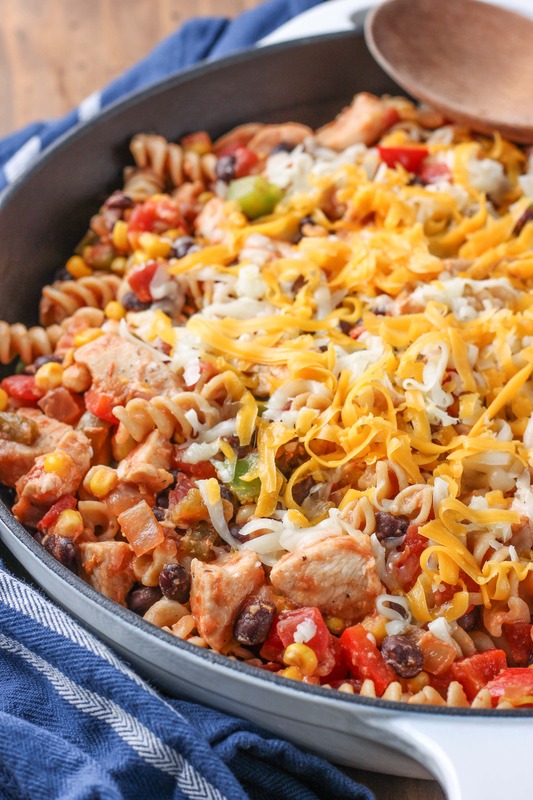 Like this cheesy salsa and chicken pasta skillet. You get your lean protein, complex carbs, and veggies all in one dish! Plus, it’s super versatile. Don’t like a certain veggie? Leave it out. Want to add more veggies in? Go for it! Change it up to match the tastes of your family! Cook pasta according to package directions. Remove from heat. Drain and cover. While pasta is cooking, drizzle olive oil in a large skillet. Add chicken and sprinkle with salt, onion powder, black pepper, and garlic. Cook over medium-high heat until lightly pink. 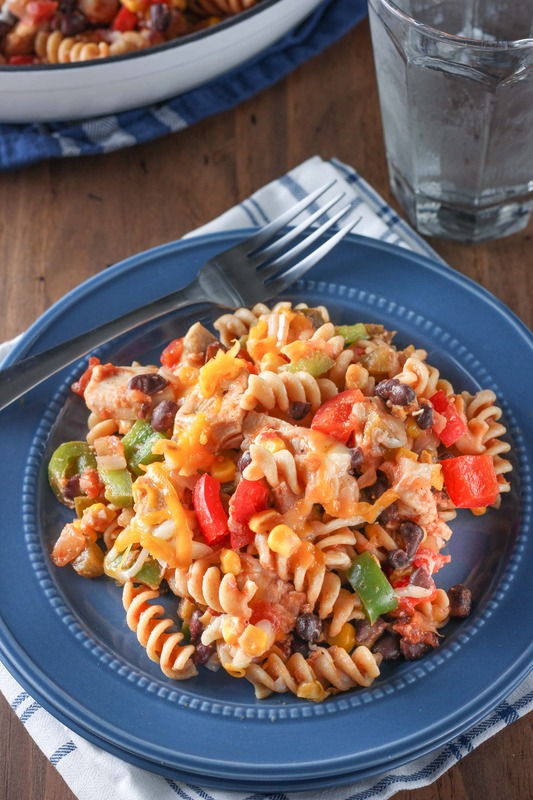 Stir in salsa, corn, green pepper, red pepper, black beans, red onion and 1¼ cup cheese. Bring to a boil and allow to simmer on medium-low heat for 5 minutes, or until chicken reaches 165 degrees F.
Stir in pasta. Sprinkle with remaining ¼ cup cheese and let stand for 5 minutes to allow sauce to thicken before serving. Yum! I like that it easy to. Love skillet pastas. Thanks! Skillet pastas are a lifesaver for us on busy nights! Wow there’s all sorts of goodness in here! Definitely bookmarking this recipe! Thanks, Chung-Ah! I hope you like it! 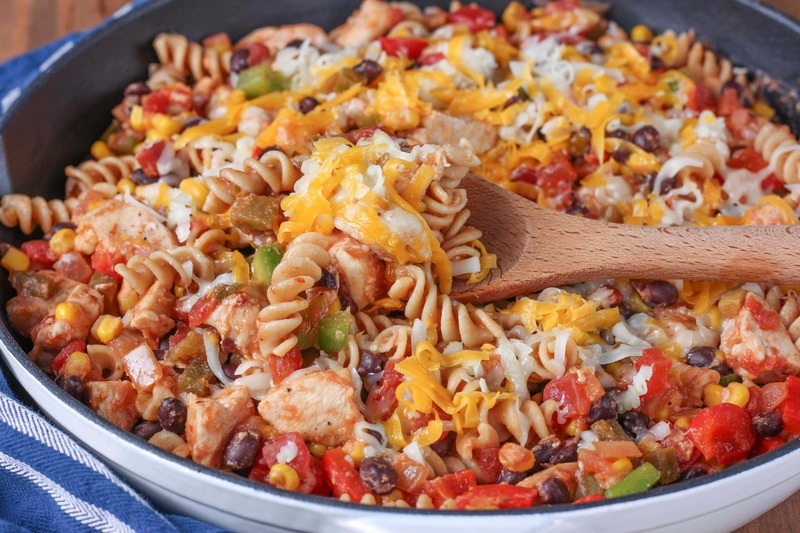 There’s nothing better than pasta in a skillet with mixed veggies! I am printing this recipe now!! I LOVE the sound of this pasta! Thanks, Holly! Let me know what you think if you get a chance to make it! Seriously. . .salads only work for so long! This looks delicious! Can’t wait to try it 🙂 Glad I came across your blog, so cute! I will definitely be subscribing. Would love for you stop by my blog sometime. 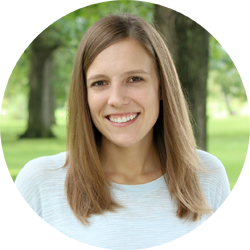 New blog friends are the best! This looks awesome! I love skillet dinners! Loving all the vegetables in this! Delish! We love mixing up skillet dinners with seasonal veggies! This looks fab cutie I love it must try!! Thanks, Ashlee! I’m sure you’ll love it! One skillet dinners are my favorite all year round, but they’re especially perfect in the heat 🙂 Yours looks wonderful! Oh my god, these pictures actually took my breath away. They look fabulous, and so tasty! Thanks, Emma! You’re too kind! I love easy dinner recipes like this! I am always searching for new ones. And the cheese + salsa combo is spot on! Looks amazing. Easy is best! 🙂 Thanks, Sally! Okay, so this may become my new addiction. It looks so good. Pinned it! mexican and pasta? I’m hooked 🙂 Looks amazing! Sorry I’ve been so MIA in commenting lately! Thanks, Abby! I totally understand! Thanks for taking the time to comment! Hope you enjoy the cartoon I linked in to Jam’s Corner’s Fabulous Friday. Have a great week. This sounds incredibly delicious….I’m on a black bean kick! Hi Jessica! I’m so glad that you found me on Foodbuzz! Now I get to pop over and read on your culinary journey. As long there’s cheese, chicken and salsa, I would self invite myself to your place for this pasta. Looks really delicious!! And I’m it is. I don’t think my blog is for healthy eaters, guilty I know, but I just love sharing treats.. Have a good weekend! Cheers Jo and stay in touch. yummy…!! your pasta tempting me a lot! that’s looks so creamy yummy! I’m making this for dinner tonight, and I’m extremely excited to shovel this deliciousness in my mouth. I absolutely loved this dish. I changed it by adding a bit of spice. It was delicious. Thank you. Pinning this to make like…tomorrow.